The endangered Siberian tiger is making a comeback, a fresh census has found. The numbers have increased about 10 percent over the last decade, thanks to WWF conservation efforts and a program overseen by the Russian president. In the 1940s, the Siberian tiger population was nearly extinct, dropping below 40; but now, it has reached 480-540, with around 100 of them cubs, the preliminary results of the census showed. The final results will be released in October. There was a jump to nearly 50 new tigers – also known as the Amur tigers – in the last decade. A census is carried out every 10 years. “This success is due to the commitment of Russia’s political leadership and the tireless dedication of rangers and conservationists in very difficult conditions,”said WWFhead for Russia, Igor Chestin. The program was set up by the Russian government in concert with the Amur Tiger Center and WWF, covering over 150,000 square km (90,000 sq. miles). It involved over 2,000 project workers and specialists carrying out field research, using GPS, satnavs and camera traps. In the summer of 2008, President Putin and Emergencies Minister Sergey Shoigu (as defense minister, now commander of Russia’s Armed Forces) visited the Ussuri Reserve and personally oversaw how the process is carried out. The president got acquainted with the technology and took a hands-on approach with the animals. At one point, a tigress woke up and broke free from her trap, with the president quickly grabbing a tranquilizer gun and putting the animal back to sleep. "The key is strong political support. Where we have it, in countries like Russia and India, we are seeing tremendous results," Mike Baltzer, who leads the organization’s Tigers Alive Initiative, said. "However, in South East Asia, where political support is weaker, we are facing a crisis. These countries stand to lose their tigers if urgent action isn't taken immediately,” he added. 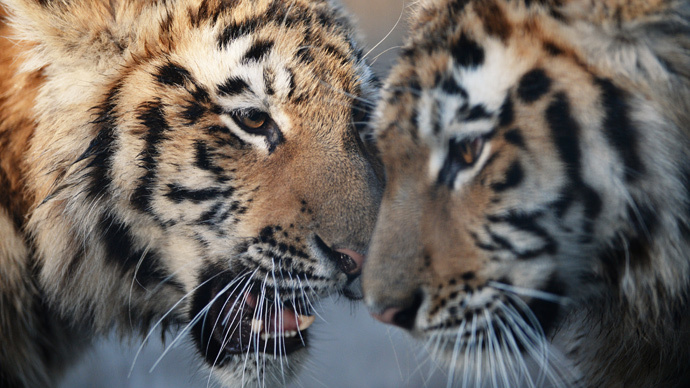 Russia has made big strides in international cooperation with others – especially China, in the relaxing of controls on state borders at the Primorsky Krai, in order to allow the free movement of tigers and Amur leopards – another animal whose conservation is now a major concern for the government. Wires were removed to prevent injuries, cameras were set up at the border, and various other measures put into place by the two countries. Now satellite signals are being beamed back to Moscow from collar trackers. The president is taking care to bring the problems faced by the big cats to the fore, even introducing a computer-animated tiger cub to Russia’s most long-running children’s show. While Putin was serving as prime minister, he got actor Leonardo DiCaprio onboard with the initiative at a summit in St. Petersburg back in 2010. This was with a view to doubling tiger numbers by 2022 – something WWF is campaigning for, and is dubbed as the Tx2 initiative. But the wonderful animal remains endangered, and it is in large part thanks to anti-poaching efforts that the killing off of the tigers was brought under control. Parts of the tigers’ bodies are in very high demand in parts of Asia – especially China and Laos. Chinese smugglers are after a whole range of animals, including leopards, elephants and rhinos, among others. Tigers are being hunted down and products containing their body parts are openly sold in luxury casinos and hotels. In Laos, wildlife protection initiatives are known to be weak, according to a report by the Environmental Investigation Agency (EIA). Russia is getting tough on abuses, however. Serious criminal charges await anyone who engages in illegal hunting or trafficking, as well as storage, of endangered animals or their body parts, according to WWF-Russia. Key to the efforts is a comprehensive census, one like the Russian government organized recently. WWF urges every country with a tiger population to do the same, seeing this as a key strategy on the way to Tx2. Southeast Asia is next in line, according to WWF. The situation in Malaysia is especially dire, with numbers down to 240-340 tigers, according to local experts. There’s a similar situation in Thailand, Myanmar and adjoining countries. Poaching remains the greatest threat faced by the graceful animal.